For much of the 2018 Monster Energy NASCAR Cup Series season, the “Big 3” of Kevin Harvick, Kyle Busch and Martin Truex Jr. have garnered plenty of attention with 17 wins in the first 26 races. 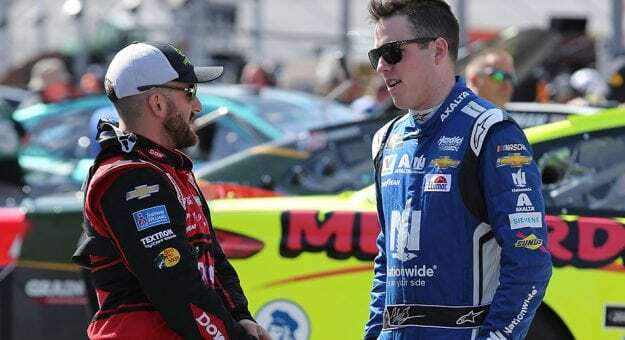 One young star had an idea on how to get around the Big 3 in the Monster Energy Series Playoffs, and he went into detail during Thursday’s NASCAR Playoffs Live Show on NASCAR.com. “If we just wreck the Big 3 the next several weeks, we’re going to have a much better shot going to Homestead,” Austin Dillon said, laughing, in posing a question to his panel of fellow young drivers in Ryan Blaney, Alex Bowman, Chase Elliott, Erik Jones and Kyle Larson. That only elicited a response from Bowman, who said “I’m not scared.” Dillon also jokingly said the group could split championship money among them. Larson, though, offered a different approach on beating the Big 3. “We’ll just beat ’em heads up. We don’t need to crash them,” Larson said. And regular-season champion Kyle Busch sees Larson as a favorite if he can get to Homestead-Miami Speedway as part of the Championship 4. Larson enters the playoffs as the 12th seed. “Obviously, Larson knows if he can get himself to Homestead and be championship-eligible, he’d be the favorite,” Busch said.